Now this is going to be fun…. If you are a photographer who uses PhotoShelter, these integration plugins will enable you to manage your portfolio, blog, and PhotoShelter photos and galleries all from one site. 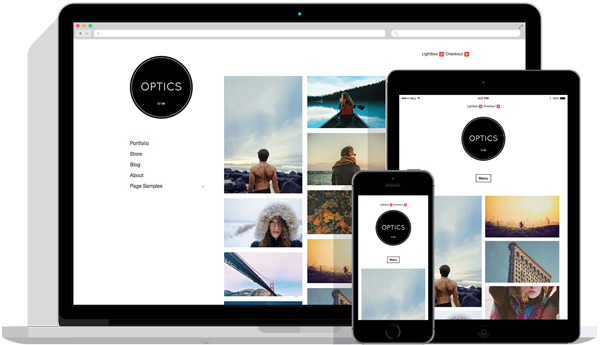 The combination of WordPress, PhotoShelter and our themes and plugins will push your web presence into the future, allowing you to connect with clients, promote, sell and license your work all from one place. How do you get this plugins? These plugins are currently only available to our paying members. You will need to sign up and become a member of Graph Paper Press to download these plugins. So, yep, that’s over 20 themes, two hours of HD video tutorials, a well-groomed support forum managed by experienced WordPressers, and these special PhotoShelter integration plugins. Here’s a secret: Jack Gruber is sporting our new On Assignment theme (a free child theme for Modularity). This theme is a free download and is available in your member area. If you are an existing GPP user, you will need to log into your Member area; if you are a newcomer to GPP, you will need to signup to download. PhotoShelter builds the best photography websites with sales and marketing tools, high-res file delivery, and secure image archiving. We serve over 48,000 photographers worldwide, from full-time pros to aspiring artists. In all honesty, if you are a serious photographer, you need PhotoShelter. Here is a little incentive: PhotoShelter is giving Graph Paper Press users a special discount. Sign up for PhotoShelter here for the special discount. The savings is a $55 discount compared to their regular monthly account ($29.99) and $25 off their advertised annual discount (normally $329). This special offer last until Oct. 31, 2009. Now lets take these plugins for a little ride, shall we? This entry was posted in Blog and tagged photoshelter, Plugins. Bookmark the permalink. Looks interesting. Would any of the plugins work on non-GPP themes? So if you had an existing WordPress site with a custom theme, and you had a Photoshelter account, could you use the plugins to display recent galleries and integrate your PS photos? Yes, they work with all WordPress themes, BUT, the default image sizes might not fit your theme correctly. Plus, the styling of the galleries is best handled by using Modularity. I’m having a problem with the integration. I have set up a wordpress site at andrewphilipphoto.com. It’s hosted at wpbloghost. I installed the Modularity theme and the photoshelter plugin. The photoshelter icon now appears in the post edit screen just as it does on the video. The first time I hit it, it asked for my photoshelter details, which I input. It appeared to log onto photoshelter, and had the dialog page as seen on the video, but no gallery or photo would appear when I hit the links at the top. I cancelled and tried again. Subsequently it has never even got to that dialog box again the transparent overlay appears onscreen, with the little “loading” twirly bar, and it gets stuck there for hours. What’s up? when I install the GPP Photoshelter plugins, gallery widget and the search widget my footer goes missing. What version of PHP are you using on your site? These plugins require PHP5. Try to determine which plugin is causing issues and I’ll help you pinpoint the issue. Does the integration work with the fullscreen theme? Not currently. But it will in the coming weeks. Do the themes available on this site work with WordPress MU also? I didnt see anything regarding requirements on the site and the “Support” area seems to be for “paying members” only, so I hope its ok to ask the question here. Yep….our themes work on WPMU. Thad, I have the same problem Andrew is having. Yet, I cannot find my way through to the Support Forums. I am a paying customer of VisualSociety, and I assumed I would be able to log-in to the Grapth Paper Forums. Is this accurate? Otherwise, would you care to explain how I can solve the integration problem with Photoshelter? Thanks a lot. VS and GPP are separate sites with thier own support systems. If you have a PRO account at VS and would like access to the GPP forum, just email me and I can hook you up. It should be noted, however, that the GPP forum is mainly used by users who are customizing the actual theme code, which users on VS cannot do. We are releasing an update to our PS plugins (we are making the three plugins into one plugin) and it should be available in the next 3-4 days. It will be loaded on VS after beta testing. It’s gonna be really, really good! Will it be possible in near future to keep the navigation menu from PhotoShelter ( Galleries, Cart, Login etc..) without to much coding? Is On Assignment working with Modularity 2.2? @Johnny – Yes and yes. You can now integrate your PS links automatically on the Modularity theme options panel. Simply add you PS handle, and your PS navigation will magically appear. I think that is a great promotion, will it be extended beyond October 31st? Yes, we have extended the promotion/discount code until November 30. Could you create the Photoshelter Gallery integration in a way that it shows the thumbs of the gallery images in a grid and doesn’t use the Flash slideshow which isn’t good for SEO? Until now I’ve been using the nextgen-gallery wordpress plugin. You can, however, the plugin can only display the uncropped PhotoShelter thumbnails. So, your thumbnails will not display as squares, but rather, in their original dimension (horizontals and verticals). We have plans for future versions to actually recrop the PhotoShelter thumbnails to squares, but the current version cannot do this. I am having trouble as well. I get an error message when I upload the zip file and try to activate the plugin…. I would love to know how to make this work. I love how this works when its done! Sounds like you don’t have PHP5 enabled. Please meet the system requirements (in the read me file contained in the download) and contact your server/web host to help you meet them. Do you know when the updated plug-in will be available? I’ve already gone through one server migration this week and would prefer not to have them move me to another server right now if it can be avoided. Photoshelter integration doesn’t work for many people. I’ve never been able to add a photo from photoshelter to an article using the “add a photoshelter photo” function. And unfortunately I never got any help from GPP support. We are aware that some users with certain server setups are having difficulty with the plugin. There are specific system requirements that some users don’t meet, so, the next version of our plugin should alleviate these issues. The plugin is currently in beta testing. We are extending memberships for free for PhotoShelter users so they can take full advantage of the new plugin. I’m glad to read that these issues are being addressed because at the moment I’m not getting what I signed up for. I have been working on the integration of the photshelter to my wordpress blog and after installing the plugin I started receiving this fatal error and now I cant do jack to the site from the back end. I was able to use my browsers back button to get to the widgets screen to deactivate the plugin…..I now have my backend back but no plugin to work this out. however I really want to get this to work. I couldn’t agree more…thanks for your post. If I want to have two separate WordPress blogs, with both of them using Modularity and both integrated with my Photoshelter account, do I need to use WordPress MU to make it happen, or is it even possible?